Divineknits is intended to be a discussion about, a journey through, and perhaps even a discovery of, that aspect of the creative process that raises knitting designs from the average to the sublime. Think of the diviner(s) (you don't have to read the book) searching with crossed sticks for that deep well of inspiration that once tapped infuses mere knit and purl, ribs and cables with an element of magic. As a result a garment - scarf, sweater, hat - what have you - is produced that is so special that knitters rush to knit it themselves. The pattern endures for decades, renewing itself with each new generation of knitters. It somehow takes on a life of its own as in, "oh, I see you've knit the......" or "you're wearing the...." and again "I promised I'd knit the....... for him." I thought that this would be an easy place to begin....any ideas? Actually please post references to special patterns, and\or designers. I will be asking designers to visit from time to time to comment, possibly post "snippets" of their work in progress. Please ask questions about patterns. Bring your own ideas to the blog for comment, help, inspiration. Tell us what you would like to see "designed". When I am not oooooing and ahhing over patterns, I am distributing them to stores, so I have favourites and I know what has been requested often over the last 10 years. Here is a perennial favourite. I have to believe that it strikes a chord with most knitters. It may not be art and it may not be divine, though many look divine in it. 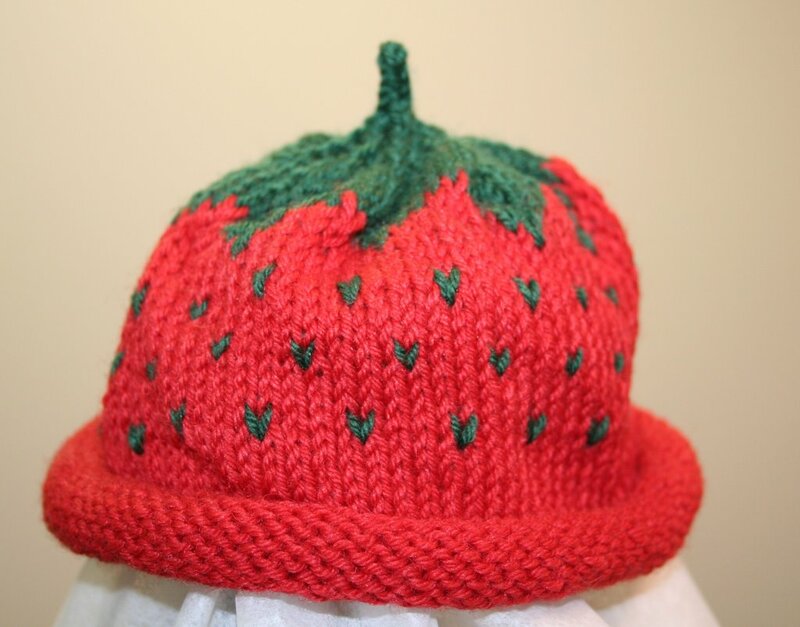 It is from Ann Norling's Fruit Caps pattern - the strawberry hat. This is a pattern that has been requested again and again over the years and it is where I got started in wholesale distribution. I was actually trying to sell kits for knitted teacups to yarn stores. I was fascinated with Debbie New's teacups. I asked her to teach me how to knit a teacup. She did - Debbie's original pattern is now available in "Unexpected Knitting" by School House Press. With Debbie's blessing, I made several designs in slightly thicker cotton and was convinced that everyone in the world would want to knit teacups.......NOT! I know that all the business books say - "don't give up", so I didn't. I pressed ahead and called stores that I had mailed information to and endured their comments. I still didn't give up. In fact one of my calls - it may have been my last call before I actually gave up was to Prairie Lily Knitting & Weaving in Saskatoon. Miriam Blackman, the owner then actually had bought several kits - even knit several teacups. She politely corrected all and I mean all the mistakes in the patterns and said that she didn't really need teacup patterns, but could use a pattern for a strawberry hat. Eureka! The business books also say - adapt and change. I found the strawberry hat pattern from Ann Norling and about 25 others that she had at the time. I was given the OK to distribute Ann Norling patterns in Canada and have been doing so ever since. I owe a lot to Miriam Blackman and would-be-designers just starting out, will find that there are Miriam Blackmans out there willing to help. After all, I understand that Lily Chin started out trying to sell designs for crocheted G-strings to Family Circle magazine. Well all of that is history now.